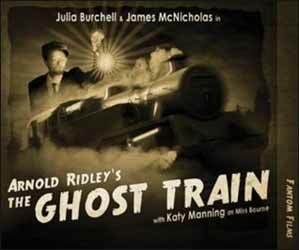 The Ghost Train is based on Arnold Ridley's (best known today for playing Private Godfrey in Dad's Army) 1923 three-act play. Now, not being familiar with the play, I'm not sure how this production compares to the stage version. Obviously, as this is only an audio production, the telling of the story could get a bit confusing if the voices aren't distinguishable from each other. So here we have accents and speech impediments acting as guides to who is talking. While this does help the listener identify each character quickly, it also becomes incredibly distracting. On the whole the acting wasn't that impressive either. In fact, the only person whose character I believed in was Katy Manning as Miss Bourne. Everyone else seems to over act for the majority of the time. In addition, not only is James McNicholas's over enforced speech impediment a pain, but his general nature is annoying too. Whether this is taken from the original is unclear, but given the play's revelations I found it a strange directional choice. Likewise, the station master's insistence in saying: "Bain't" (meaning "be not") all the time was annoying, but then maybe in 1920s England people in Cornwall really did say that all the time. To be fair the original source material still stands up today as an interesting mystery story. I was half expecting the passengers to be the dead spirits of the the crashed train, which would probably have been original in the '20s, but has been done to death (if you'll excuse the pun) in recent years. While this is entertaining enough, it's just a shame that the overacting spoils what is a good mystery.